This won't come as a shock to many of you, but if there's a Hell, and if I wind up going there (in a handbasket or otherwise), it will almost certainly be for gluttony. Anyone who cooks and eats as much as I do is bound at least to be a candidate, if not a shoo-in, for the third circle. Accordingly, when I found myself with leftover pastry cream this weekend, there was only one thing to do about it: make some choux paste, and bake up some eclairs and cream puffs. I get the sense that choux paste, or pâte à choux, has gotten a bit of an undeserved reputation for difficulty. I once brought chocolate eclairs to a potluck, and from people's reactions, you would have thought that I had made the sort of thing you see on the World Pastry Championships. All I'd made was a bit of choux paste, some pastry cream for filling! 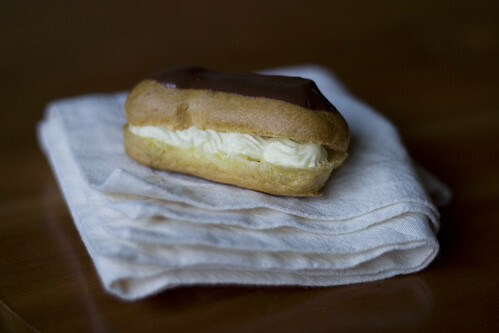 Seriously folks, eclairs and cream puffs might look fancy and sound like they'd be all kinds of tricky and temperamental, but they aren't. They just aren't. You boil together some water and butter, you dump in some flour and beat it like crazy, add some eggs, and beat some more until you start to see a film on the bottom of the pan. It's that simple. Choux paste is not only one of the easiest items in a baker's repertoire, it's also one of the fastest. You can go from raw ingredients to baked cream puffs in under half an hour, plus a little more time for the oven to heat up. It's perfect for when you find yourself with unexpected guests, because it bakes up quickly and can be filled with all manner of things. You get the idea. There is no reason for this not to be in your cooking arsenal. The recipe I've written up here (below the fold) is the master recipe from Julia Child's Mastering the Art of French Cooking. It's served me well for as long as I've had that book, which is going on several years now. This is the sweet version, suitable for filling with things like ice cream, whipped cream, pastry cream, or--in my case--a combination of whipped cream and pastry cream. Fresh berries would not be out of place, and indeed I couldn't resist placing fresh raspberries on top of the cream in some of mine. If you are so inclined, the paste would also be excellent fried up and rolled in sugar (or cinnamon sugar). 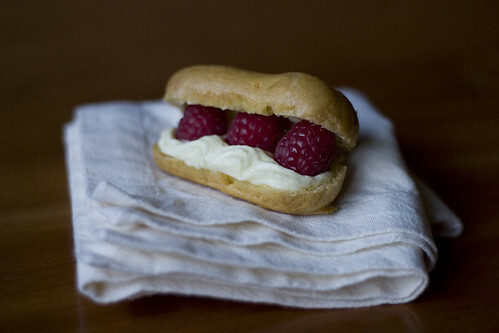 And if on the other hand an hors d'oeuvre is what you have in mind, I have included instructions at the end of the recipe for a savory pâte à choux. So have at it! Combine the water, butter, sugar, and salt in a 1 1/2-quart, heavy-bottomed saucepan. Bring the mixture to a boil, and simmer until the butter has melted. While the butter melts, measure out the flour. Remove the pan from the heat and immediately dump in all of the flour. Beat it the mixture vigorously with a wooden spoon or spatula for several seconds, or until thoroughly blended. Return the pan to moderately high heat, and beat the mixture for a further 1-2 minutes. The mixture should come together in a ball, pulling away from the spoon and the sides of the pan, and leaving a slight film on the bottom of the pan. Remove the pan from the heat. Make a well in the center of the paste, and break one of the eggs into the well. Beat it into the paste for several seconds, until it has been absorbed and the mixture is smooth. Repeat with the remaining eggs; it will take a bit longer for the last two eggs to be properly absorbed, so keep beating. Once they're all absorbed, beat just a bit more to ensure that everything is well blended. Fit a pastry bag with a 1/2-inch round tip, and spoon the paste into it. Squeeze the paste onto a buttered or parchment-lined baking sheet, forming mounds about 1 inch in diameter and 1/2 inch high, and spacing mounds about 2 inches apart. Smooth peaks and rough spots with the flat side of pastry brush dipped in an egg beaten with 1/2 teaspoon water (or simply a wet fingertip). Bake in a 425F/220C oven for approximately 20 minutes. The puffs are done when they have doubled in size and turned golden brown, and are crusty to the touch. Return the puffs to the oven, turn the oven off, and leave the door ajar for 10 minutes. Cool puffs completely on a rack, fill as desired, and serve. Fit a pastry bag with a 3/4-inch round tip, and spoon the paste into it. Squeeze the paste onto a buttered or parchment-lined baking sheet, forming mounds approximately 2 inches in diameter and 1 inch at the highest point, and spacing the mounds 2 inches apart. Smooth peaks and rough spots with the flat side of a pastry brush dipped in an egg beaten with 1/2 teaspoon water (or simply a wet fingertip). Bake in a 425F/220C oven for 20 minutes, until the puffs are lightly browned and have doubled in size. Reduce the oven temperature to 375F/190C and bake a further 10-15 minutes, or until the puffs are golden brown and crusty to the touch. Remove the baking sheet from the oven, and use a sharp knife to cut a 1-inch slit in the side of each puff. If at the end of 10 minutes the puffs are damp inside (open one to find out), remove the damp centers from the puffs. Do this either by sticking the handle of a teaspoon through the slits in the puffs and scraping out the centers, or by cutting the puffs in two horizontally and scraping out the damp centers with a fork. If you choose the latter method, allow the halves to cool separately, and then replace the tops once they have cooled. The recipe above is for a dessert puff. For a savory version: eliminate the sugar, increase the salt to 1 teaspoon, and add 1/8 teaspoon freshly ground pepper and a pinch of freshly grated nutmeg. These seasonings should be added in the first step, combined with the butter and water. A plastic bag makes a reasonably good substitute for a pastry bag. Cut one corner to make an opening of the desired size. If you do not wish to use the paste immediately (while it is still warm), you can keep it in the fridge for a few days, or freeze it. Rub the surface with butter and cover it with waxed paper (or plastic wrap) to prevent a skin from forming. To reheat, set it in a heavy-bottomed saucepan over low heat and beat vigorously until it is smooth, lump-free, and warm (not hot) to the touch. Do not heat it too much, or it will not puff properly. 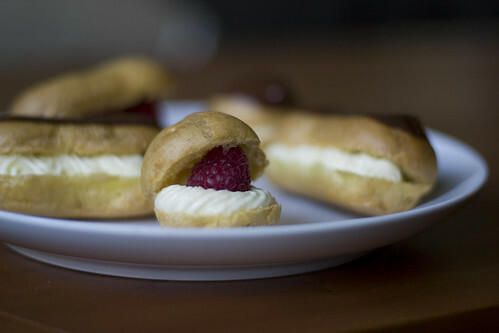 Large puffs made with reheated paste might not puff as well as with fresh paste, but small ones should do fine. The baked puffs freeze well. Thaw and re-crisp them by setting them in a 425F/220C oven for 3-4 minutes, then proceed with the filling and serving. 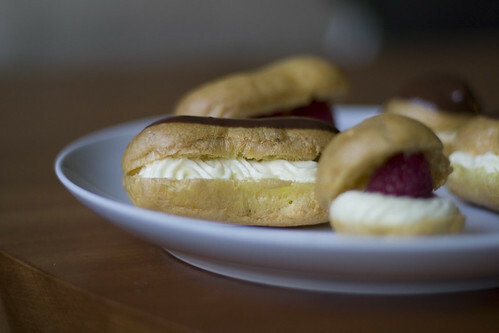 LOVE, LOVE, LOVE eclairs and cream puffs! One of my absolute favorites, and like you mentioned, they always get raves disproportionate to the actual work/skill required. My mother used to make them often for dinner parties, when I was a child, and I used to look forward to having a slightly soggy one for breakfast the morning after!! How fun! What a great childhood memory. They really do make for great entertaining food. One of these days I'll start having dinner parties and/or find another potluck group, and when I do, this sort of thing will probably be a staple.